I've just purchased an Inspiron 660 with 6GB of ram and have noticed problems with my mouse wandering for no reason and slowness in normal everyday operations. I looked at my ram and found 2GB and 4GB sticks, but both different makes. Could I replace the 2 mismatched sticks for either Crucial 4GB DDR3 1600Mhz Ballistix Tactical Memory or the Corsair XMS3 4GB DDR3 1600Mhz and will they work with the 660? Mouse wandering is probably due to a bad mouse. For memory, check the Crucial site for what they recommend for the 660. You may not see much difference in performance with a matched 8GB set. Agree with what KirkD wrote about the mouse. Thanks both for the help. I've ditched the rodent and i'll give the CPU-Z a try. I was in a rush earlier and meant to add some more comments. I would visit crucial.com as Kirk recommended, run their scanner tool and see what it reports, and what it recommends. I think your memory is running in single channel mode because of the mis-matched memory. In this case you might see a 10 to 20% increase by getting a matched set of memory that runs in dual channel mode. If your system is down clocking the mis-matched memory, I'm not sure if that shows up in the crucial memory system scanner, but it will show on CPU-Z. If your memory is running at 1333 Mhz (DRAM frequency of 665 Mhz on CPU-Z) then try removing the 2GB stick of memory, and re check with CPU-Z to see if it clocks up to 1600. If the memory is down clocked, then you will benefit even more by a matching set of memory running in dual mode and at full DDR3-1600 Mhz speed. When you order, make sure you get the correct CAS latency for your system. Some dell systems don't like memory that is different than what they came with and end up running slower than they should. I've noticed some recent price dips on 8GB (2x4GB) memory kits so its not a bad time to buy. good luck with the memory. edit: my comment on the 10 to 20 % improvement is memory operation improvement. This may or may not give a noticeable improvement in system performance. It will help for file compressing / decompressing (tools like zip or 7zip) video encoding, photo rendering or audio encoding. It helps, and can make a sluggish system a bit snappier but I would not expect huge performance improvements. The main improvement to a system is having enough RAM so it doesn't run short. I used to think dual channel was a big boost over single channel, but had read recently that this is no longer true with modern hardware. I found an well executed extensive benchmark study of dual/single speeds. The majority of the benchmarks showed almost no difference. Several esoteric tests did show 10-20% improvement for dual, while some "normal" benchmarks showed slight improvement for single channel. The big issue is to use matched pair to get maximum speed, as DAN-H wrote. 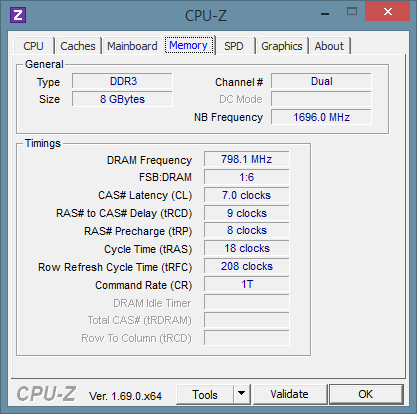 ive checked with cpu-z and my dram frequency is 798.4. How do I change it to 1600 as you suggested. my dram frequency is 798.4. If your DRAM frequency was 666.5, that would mean it is running at 1333. DDR in DDR3 stands for Double Data Rate, so if you multiply 798.4 times two you'll be at roughly 1600 Mhz. The screen shot I posted is DDR3 1600 memory running in my XPS 8700 and it has similar DRAM frequency. So, it isn't downclocking which is good. You might see better performance with a matched pair of memory, or you might see the same performance. Also, depending on what applications you are running, 6GB may not be enough. If you are running out of Physical RAM, and begin to page, then the performance really suffers.